The dogs at Orphans of the Storm® are happy to celebrate our country’s independence this 4th of July, but they’re also ready to find a dependable family! Orphans of the Storm® will be closed on the 4th, but will be open during its normal hours (11am-5pm) all weekend. Maybe save some of your BBQ leftovers for your new pooch! Shogun the twelve-year-old Labrador Retriever mix is still plenty spry for his age. He may have some gray fur around his nose, but other than that he isn’t showing any signs of aging. When he first came out of his kennel, he was off and running and couldn’t wait to have some fun in the off-leash run. As has been the case with other dogs at the shelter far too often recently, Shogun’s previous owners could no longer care for him. Shogun is more than ready to find his new, permanent family. 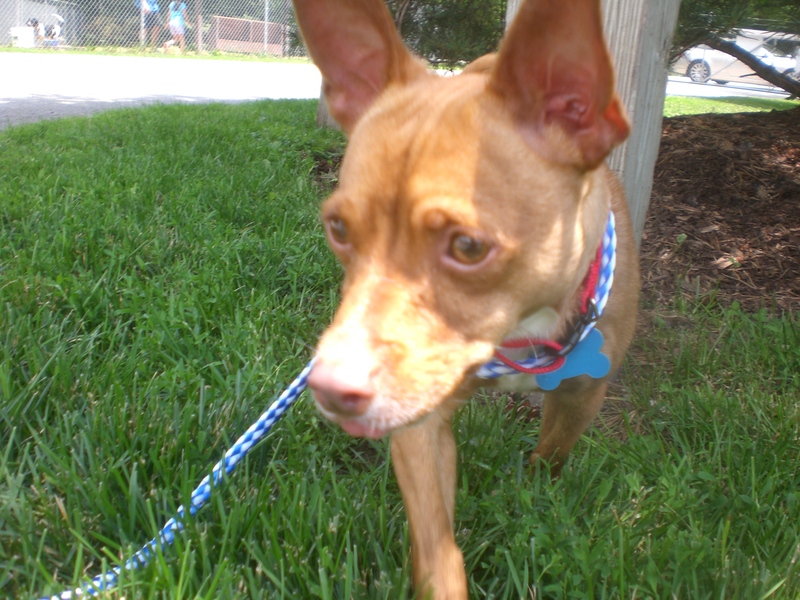 Shogun is a friendly guy who greets people with a wagging tail. He enjoys getting his back, chin, and ears scratched, and will stay right by you while you pet him. 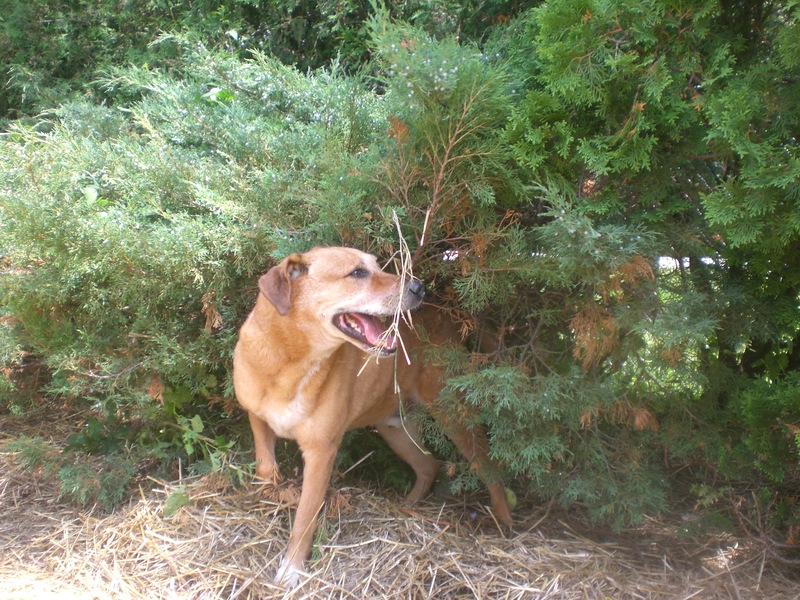 Shogun loves getting his back scratched so much, in fact, that he will use the branches of a bush to do so! Do you have bushes in your backyard? Shogun would love them. 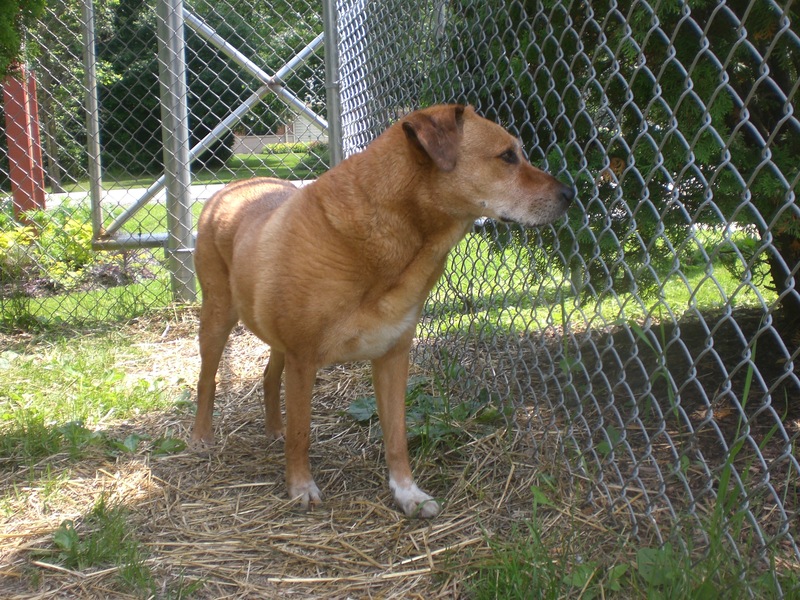 Now is the perfect time to give this senior pooch a chance at a happy home in which to spend his golden years. If you’re looking for a big lovebug, come in soon to meet Shogun! 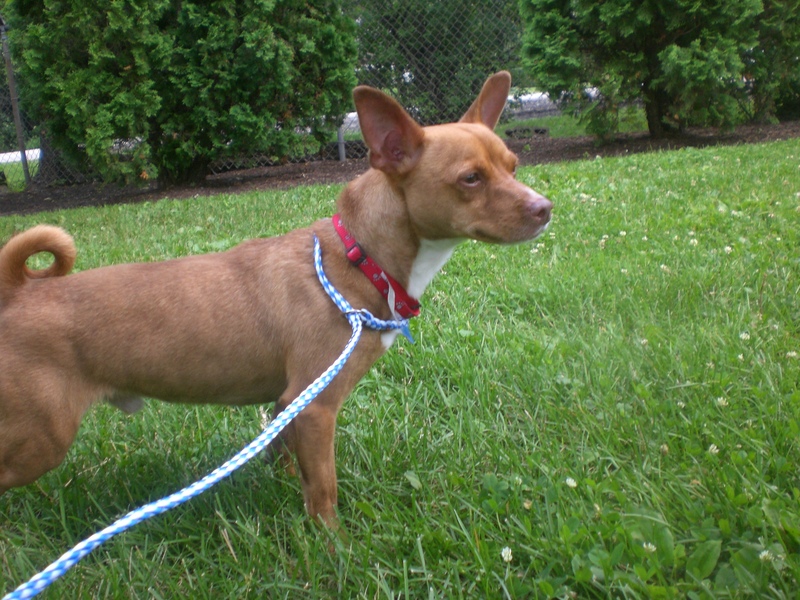 Louie the two-year-old Chihuahua mix is a playful cutie who is full of energy. Louie isn’t the type of little dog who wants to be carried around in a purse–Louie wants to use his own four legs to get around, and get around he does. It was hard to get a good picture because he was darting this way and that way! Louie also doesn’t let his size deter him; he seems to be an adventurous sort. Louie may like to run around, but even so he was perfectly fine with me picking him up and holding him (though he was more than happy to spring back onto the ground when I was done). Once he gets his playtime for the day, he’ll be happy to join you for some snuggles. If you’re looking for a little dog with big-dog-sized energy, Louie might just be the pooch for you! Stop by the shelter soon to find out. 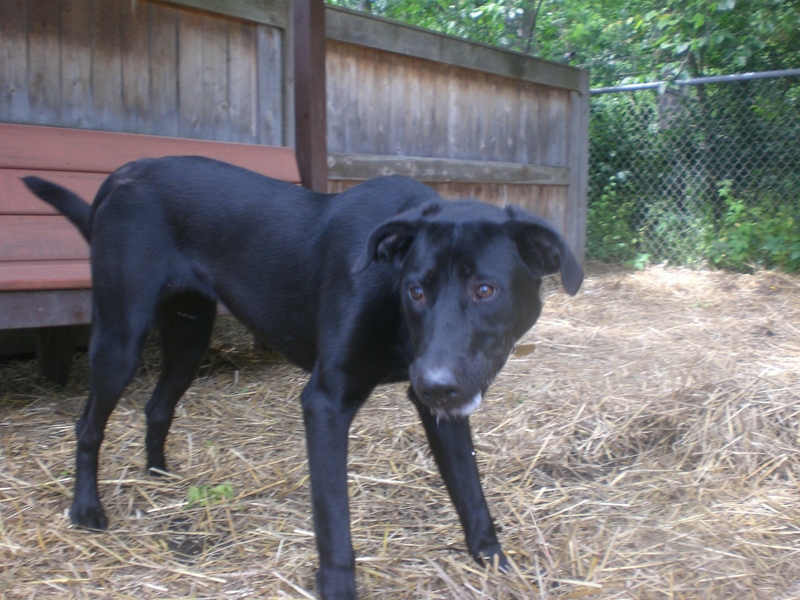 Brooklyn the one-year-old black Labrador Retriever mix is another pooch who is full of energy, but she has an excuse: she is most definitely still a puppy! And all this puppy wants to do is find a family who will play with her and give her plenty of attention. When you walk by Brooklyn’s kennel to say hello, her entire body starts wiggling because her tail wags so hard from side to side. Talk about one happy dog! Since Brooklyn is still a puppy, she hasn’t quite mastered her leash manners yet–but I’m sure she would be an eager learner, especially with food as a reward. Brooklyn used that doggy nose of hers to unearth a treat from under the hay inside the off-leash run. Brooklyn also loves toys and was getting jealous when the dog in the run next to ours got to chase a squeaky, so I found a toy of her own for her to play with. If you’re thinking about adding a big pup to your family, please consider Brooklyn! 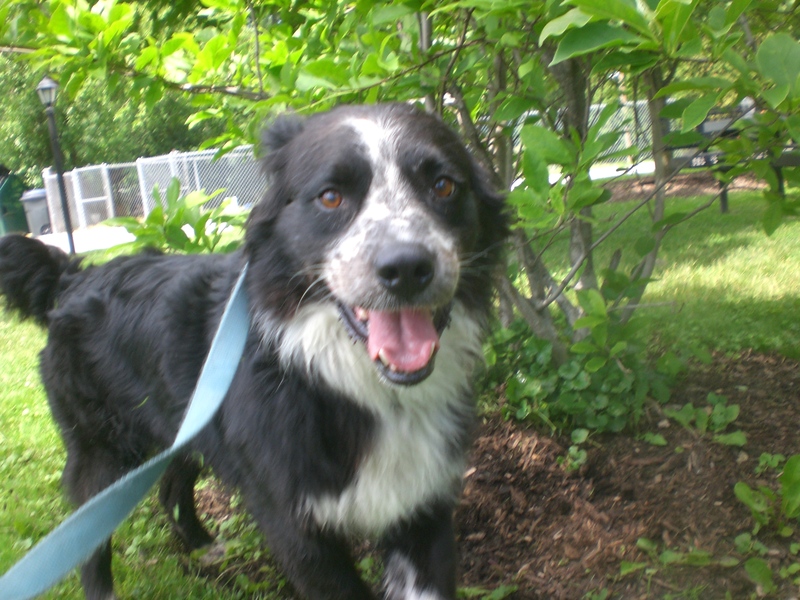 Sylvester the six-year-old Border Collie/Australian Shepherd mix is such a sweet, calm boy. He was by far the best leash-walker of the day, happily staying by my side and rarely pulling. 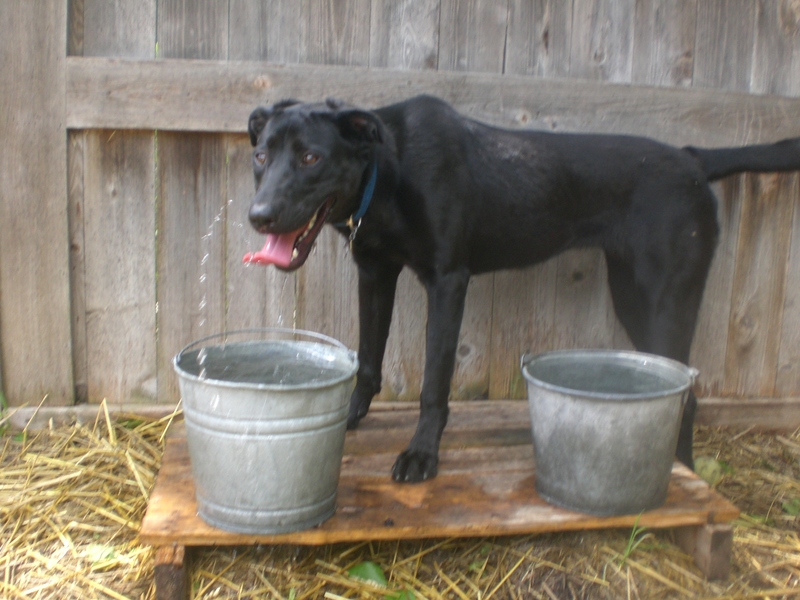 Sylvester is currently sharing his kennel with another dog, so he could go to a home with or without another furry friend. Sylvester has such soft, pretty, surprisingly curly fur and an adorable, lovable face. Sylvester likes to snuggle. When I sat down on a bench, he put his face right into my lap and gave me a big doggy grin while I scratched his neck and ears. He then proceeded to walk underneath my legs and stand there while I continued to pet him. This guy is certainly companion material! Come by the shelter soon to see if Sylvester could be the next member of your family. I also saw some of my favorite seniors Archie, Ebbie, Emerald, and Scotty, and two of my favorite active buddies Molly and Rock (who, like Zeus, is back from training and walks so much better on the leash now, especially after he’s had a chance to run off his energy). And the day after I visited the shelter, I stopped by Orphans of the Storm®’s Pet Showcase at Northbrook Court! There was a great group of adoptable cats there that day, and there are many (MANY!) more adoptable cats waiting in the brand new cat wing at the shelter. 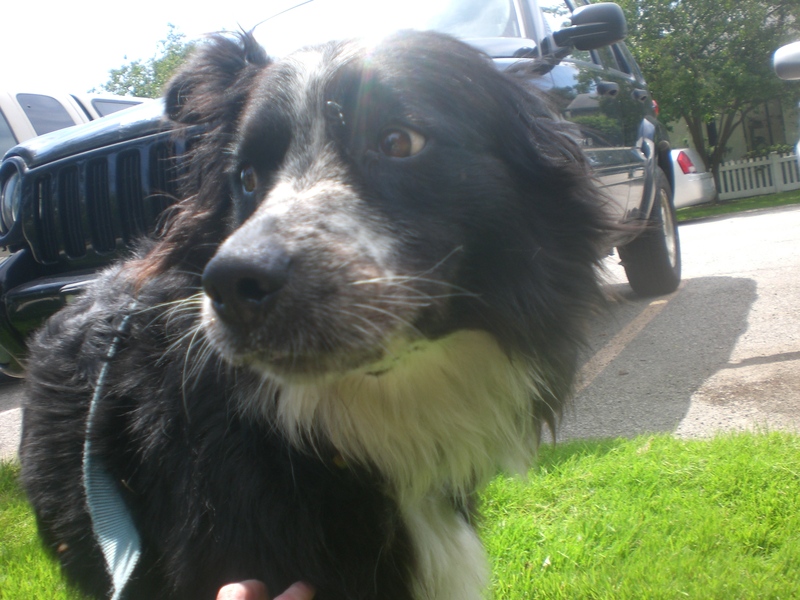 Posted by Meet the Pooches on July 3, 2014 in Dog Profiles and tagged adoption, animal shelter, animals, Australian Shepherd, Border Collie, Chicago, Chihuahua, dogs, Labrador Retriever, Orphans of the Storm, pets.